A, Left, The tail is measured 4 cm from the tip and marked. With the use of a scalpel, the tail is transected at the mark. Right, The tail stump is placed in a 1.8-mL microcentrifuge tube to collect shed blood. Blood loss is quantitated every 2 to 5 minutes. B, Blood loss over time. Total blood loss was 15.4% of total blood volume (TBV). C, Heart rate over time. D, Change of mean arterial pressure (ΔMAP) from baseline. Arrowheads represent time of injury. Data points represent means; whiskers, SE. A, Left, 12-mm punch biopsy tool. Top right, Punch specimen is taken from the left lateral lobe of the liver. The back of a scalpel handle is used to support the punch instrument inferiorly. Bottom right, Injured lobe of the liver. B, Blood loss over time. Total blood loss was 16.7% of total blood volume (TBV). C, Heart rate over time. D, Change of mean arterial pressure (ΔMAP) from baseline. Arrowheads represent time of injury. Data points represent means; whiskers, SE. A, Top left, The left lateral lobe of the liver is transected. Right, The cut edge of the liver is demonstrated by the white asterisk. Preweighed gauze is placed beneath the liver injury and changed at 2- to 5-minute intervals to quantitate blood loss. Bottom left, The transected portion of liver. B, Blood loss by time. Total blood loss was 19.8% of total blood volume (TBV). C, Heart rate over time. D, Change of mean arterial pressure [ΔMAP] from baseline. Arrowheads represent time of injury. Data points represent means; whiskers, SE. A, Top left, The spleen and vessels are exposed. Right, The spleen is transected transversely between the entrances of the splenic vessels. Bottom left, The arrowheads and asterisk represent the 3 transected sections of spleen. B, Blood loss by time. Total blood loss was 27.9% of total blood volume (TBV). C, Heart rate over time. D, Change of mean arterial pressure (ΔMAP) from baseline. Arrowheads represent time of injury. Data points represent means; whiskers, SE. A, Taking into account the percentage of loss of total blood volume (TBV) and the hemodynamic profile, the tail-cut and liver punch biopsy models correlate best with class I hemorrhagic shock, whereas the liver laceration and spleen transection models correlate best with class II hemorrhagic shock. B, Loss of TBV by model. C, Heart rate by model. D, Mean arterial pressure (MAP) by model. aP < .001 vs tail-cut and liver punch biopsy models and P = .003 vs liver laceration model. Importance Hemorrhage is the leading cause of death in military trauma and second leading cause of death in civilian trauma. Although many well-established animal models of hemorrhage exist in the trauma and anticoagulant literature, few focus on directly quantitating blood loss. Objective To establish and validate a reproducible rodent model of uncontrolled hemorrhage to serve as the foundation for developing therapies for noncompressible torso trauma. Design, Settings, and Subjects We developed and evaluated 4 different hemorrhage models using male Sprague-Dawley rats (6 rats/model), aged 10 to 14 weeks and weighing 330 to 460 g, at the Department of Surgery, Northwestern University. Interventions We used tail-cut (4 cm), liver punch biopsy (12 mm), liver laceration (3.0 × 1.5 cm), and spleen transection models. All animals underwent invasive hemodynamic monitoring. Main Outcomes and Measures Blood loss, expressed as a percentage of total blood volume (TBV), mean arterial pressure, and heart rate, which were recorded at 2- to 5-minute intervals. Results The tail-cut model resulted in a mean (SD) TBV loss of 15.4% (6.0%) with hemodynamics consistent with class I hemorrhagic shock. The liver punch biopsy model resulted in a mean (SD) TBV loss of 16.7% (3.3%) with hemodynamics consistent with class I hemorrhagic shock. The liver laceration model resulted in a mean (SD) TBV loss of 19.8% (3.0%) with hemodynamics consistent with class II hemorrhagic shock. The spleen transection model resulted in the greatest blood loss (P < .01), with a mean (SD) TBV loss of 27.9% (3.4%) and hemodynamics consistent with class II hemorrhagic shock. The liver laceration and punch biopsy models resulted in most of the blood loss within the first 2 minutes, whereas the spleen transection and tail-cut models resulted in a steady loss during 10 minutes. The liver laceration and spleen transection models resulted in the greatest degree of hemodynamic instability (mean [SD] arterial pressure decreases of 25  and 41  mm Hg, respectively). One-hour survival was 100% in all 4 models. Conclusions and Relevance We established and validated the reproducibility of 4 different rat models of uncontrolled hemorrhage. These models provide a foundation to design novel nonsurgical therapies to control hemorrhage, and the different degrees of hemorrhagic shock produced from these models allow for flexibility in experimental design. Hemorrhage is the leading cause of death in military trauma and the second leading cause of death in civilian trauma.1,2 Noncompressible torso trauma (NCTT) or bleeding that is not amenable to immediate external compression as a means of control represents a major problem in traumatic hemorrhage. Noncompressible torso trauma is defined as a pulmonary injury, a grade IV or greater solid organ injury, injury to a named axial vessel, or a pelvic fracture with ring disruption.3 Control of NCTT is largely limited to surgical techniques, unlike compressible hemorrhage, which can be controlled in the field using compression or a tourniquet. Noncompressible torso trauma represented 12.7% of all battlefield injuries in the latest US conflicts in Iraq and Afghanistan, with 17.7% of those injuries presenting with shock and requiring urgent control of hemorrhage.4 In fact, hemorrhage is the cause of up to 80% of survivable injuries sustained in Iraq and Afghanistan.2 A similar study looking at the National Trauma Data Bank,5 which represents the civilian population, demonstrated that NCTT represented 15% of all injuries. Patients who presented with hemorrhage and shock experienced a 45% mortality rate, whereas patients who presented with hemorrhage alone experienced a 7% mortality rate. Given that NCTT requires operative control of bleeding in most cases, the need for nonoperative therapies to control hemorrhage in the remote trauma setting, such as the battlefield, is urgent. A significant limitation in the development and testing of field-expedient therapies for NCTT is the lack of a consistent, quantifiable, and well-characterized animal model. Several rodent models of hemorrhage and hemorrhagic shock have been described in the literature. A common model involves controlled hemorrhagic shock, with blood loss stimulated by removing a predetermined amount of circulating blood through a catheter.6 In addition, uncontrolled hemorrhage models have been used mainly in the study of hemorrhagic shock and resuscitation and involve injury resulting in hemorrhage. Some of the uncontrolled hemorrhage models include a tail amputation of 10% to 75% of the length,7,8 injury to the mesenteric vasculature,9 liver injury that consistently produces massive blood loss in the setting of fluid resuscitation,10 and a spleen injury with similar results.11 Another group of studies12,13 looked at bleeding time and blood loss from intra-abdominal solid organ injuries in the setting of anticoagulant or antiplatelet therapy. However, because the models described above simulate hemorrhage but do not have defined and quantifiable outcome measures of blood loss, we sought to develop and validate quantifiable rodent models of hemorrhage. Thus, our objective was to develop a rodent model of acute noncompressible hemorrhage that resulted in more than 10% loss of total blood volume (TBV). The model needed to have reproducible and easily quantifiable methods for blood loss during multiple points throughout early bleeding. In addition, hemodynamic monitoring to correlate blood loss with physiologic response was needed. We chose not to include a resuscitation portion of the model because our focus is on creating a hemorrhage-only model with quantifiable blood loss over time. We hypothesized that rodent models of uncontrolled hemorrhage can be developed and result in reproducible and quantifiable outcome measures. These models will serve as the foundation for future studies to assess novel nonoperative therapeutics to prevent hemorrhage. All animal procedures were performed in accordance with the Guide for the Care and Use of Laboratory Animals and approved by the Animal Care and Use Committee of Northwestern University. Animals were adult male Sprague-Dawley rats (Harlan Laboratories) aged 10 to 14 weeks and weighing 330 to 460 g. Rats were housed in pairs in cages under controlled temperature and humidity with food and water constantly available. Six rats were used for each model type. Standard surgical instruments were used, including toothed forceps, scissors, microsurgical forceps-scissors, retractors, and a bulldog clamp (eFigure in the Supplement). We used 4-0 silk ties for arterial control and a 2F polyurethane catheter for carotid artery cannulation (Solo-Cath polyurethane [Harvard Apparatus]) (eFigure, A in the Supplement). A surgical microscope (Nikon SMZ 645; Nikon Instruments Inc) was used for carotid artery catheter placement (eFigure, B in the Supplement). Rats were anesthetized initially with 5% isoflurane in 100% oxygen. A surgical plane of anesthesia was maintained with 3% to 5% isoflurane. We collected blood pressure and heart rate data using a commercially available acquisition system (PowerLab; ADI Instruments) (eFigure, C in the Supplement). A 2F polyurethane catheter was placed in the common carotid artery using microsurgical techniques (eFigure, D in the Supplement). Luer stubs (LS25 25-gauge × 1.27 cm; Instech, Harvard Apparatus) were used to connect the catheter to the pressure transducer (APT300 for PLUGSYS Transducer Amplifier Module; Harvard Apparatus) (eFigure, E in the Supplement). We analyzed blood pressure and heart rate data using the acquisition system software interface (LabChart Pro; ADI Instruments) (eFigure, F in the Supplement). Mean arterial blood pressure (MAP) and heart rate were recorded at 2-minute intervals for the first 10 minutes, then at 5-minute intervals for the duration of the experiment. At the end of the experiment, animals were killed humanely. To determine 1-hour survival, an additional 3 animals were studied for each hemorrhage model and the experimental time was extended to 60 minutes. Animals remained under anesthesia with the carotid artery catheters in place to record hemodynamics. At the end of 60 minutes, blood was drawn for coagulation studies, and those animals still alive after the blood draw were allowed to recover from anesthesia. We obtained and analyzed blood samples from 3 animals in each hemorrhage model. At the end of 60 minutes, blood was drawn passively through the common carotid artery catheter. A total of 3.3 mL (10% of TBV) was required from each animal to perform a complete blood cell count, platelet count, and coagulation panel (determination of prothrombin time [PT], partial thromboplastin time [PTT], fibrinogen level, and level of fibrin degradation products). Three animals that did not undergo hemorrhage were used as control subjects. Animals selected for the tail-cut model were positioned with the tail toward the surgeon after the carotid artery catheter was placed. The tail was marked 4 cm from the tip, and transected using a scalpel (Figure 1A [left]). The tail stump was placed in a 1.5-mL microcentrifuge tube to collect the shed blood (Figure 1A [right]). Animals selected for the liver punch biopsy model were positioned with the tail toward the surgeon after the carotid artery catheter was placed. A midline laparotomy was performed to expose the abdominal cavity, and the left lateral lobe of the liver was exposed. A 12-mm biopsy punch (AcuPunch, Acuderm Inc) (Figure 2A [left]) was used to create a full-thickness injury to the left lobe of the liver. The punch was performed within 2 mm of the edge of the liver and was supported by a scalpel blade placed inferior to the liver lobe to protect surrounding organs (Figure 2A [top right]). Preweighed gauze was placed inferior to the liver before injury. The gauze was exchanged and weighed at intervals as previously described. Animals selected for the liver laceration model were positioned with the tail toward the surgeon after the carotid artery catheter was placed. A midline laparotomy was performed to expose the abdominal cavity, and the left lobe of the liver was exposed. A 3.0 × 1.5-cm section of the edge of the left liver lobe was transected to cause liver injury (Figure 3A [top left]). Preweighed gauze was placed inferior to the liver before injury (Figure 3A [right]). The gauze was exchanged and weighed at intervals as previously described. Animals selected for the spleen transection model were positioned with the tail toward the surgeon after the carotid artery catheter was placed. A midline laparotomy was performed to expose the abdominal cavity, and the spleen was exposed (Figure 4A [top left]). The spleen was transected in the transverse plane (Figure 4A [right]) in 2 locations between the entrances of the splenic vessels to create 3 sections (Figure 4A [bottom left]). Preweighed gauze was placed inferior to the spleen before injury. The gauze was exchanged and weighed at intervals as previously described. We used commercially available software for statistical analysis of the data (SYSTAT; SigmaPlot Software, Inc). We compared blood loss between models using 1-way analysis of variance. Unless otherwise indicated, data are expressed as mean (SD). We performed the tail-cut model in 6 animals (Figure 1A). The mean loss of TBV was 15.4% (6.0%). Most of the bleeding occurred in the first 2 minutes but continued steadily until the 8-minute point (Figure 1B). In terms of hemodynamics, heart rate did not vary significantly from baseline (Figure 1C). Mean arterial pressure dropped by a mean of 4 (3) mm Hg in the first 2 minutes and returned to baseline for the remainder of the experiment (Figure 1D). With respect to hematologic and coagulation variables, the tail-cut model resulted in a significant drop in hemoglobin (2.7 g/dL [P = .004]) (to convert to grams per liter, multiply by 10.0) and fibrinogen (120 mg/dL [P = .02]) (to convert to micromoles per liter, multiply by 0.0294) levels compared with controls, whereas PT, PTT, platelet count, and fibrin degradation product level remained unchanged (eTable in the Supplement). We performed the liver punch biopsy model in 6 animals (Figure 2A). The mean loss of TBV was 16.7% (3.3%), with most of the blood loss occurring in the first 2 minutes (Figure 2B). Blood loss was stabilized by 6 minutes, with minimal subsequent loss. In terms of hemodynamics, the heart rate did not vary significantly from baseline (Figure 2C). Mean arterial pressure decreased by a mean of 14 (7) mm Hg in the first 2 minutes and remained in the range of 11 to 15 mm Hg below baseline for the remainder of the experiment (Figure 2D). With respect to hematologic and coagulation variables, the liver punch biopsy model resulted in a significant decrease in the PT (1.5 seconds [P = .04]) compared with controls, which is likely not clinically significant, but we found a similar PTT, fibrinogen level, hemoglobin level, platelet count, and fibrin degradation product level compared with those of controls (eTable in the Supplement). We performed the liver laceration model in 6 animals (Figure 3A). The mean loss of TBV was 19.8% (3.0%). Most of the blood loss occurred in the first 2 minutes, and loss stabilized to a minimal amount by the end of 4 minutes (Figure 3B). In terms of hemodynamics, heart rate did not vary significantly from baseline (Figure 3C). Mean arterial pressure decreased by a mean of 25 (1) mm Hg in the first 2 minutes and remained in the range of 20 to 25 mm Hg below baseline for the duration of the experiment (Figure 3D). With respect to hematologic and coagulation variables, the liver laceration model resulted in a significant drop in the hemoglobin level (1.8 g/dL [P = .04]) compared with controls, whereas the PT, PTT, fibrinogen level, platelet count, and fibrin degradation product level remained unchanged (eTable in the Supplement). We performed the spleen transection model in 6 animals (Figure 4A). The mean loss of TBV was 27.9% (3.4%). Compared with the other models, in which most of the blood loss occurred in the first 2 to 6 minutes, the blood loss in the spleen transection model occurred throughout the model, slowly tapering off throughout the duration of the experiment (Figure 4B). In terms of hemodynamics, heart rate did not vary significantly from baseline (Figure 4C). Mean arterial pressure decreased by a mean of 13 (8) mm Hg in the first 2 minutes, but continued to decline to 41 (11) mm Hg below baseline by the end of the experiment (Figure 4D). With respect to hematologic and coagulation variables, the spleen transection model resulted in a significant decrease in the platelet count (329 × 103/µL [P = .003]) (to convert to ×109 per liter, multiply by 1.0) compared with controls, whereas the PT, PTT, fibrinogen level, hemoglobin level, and fibrin degradation product level remained unchanged (eTable in the Supplement). We used the hemodynamics and percentage of TBV loss to correlate each rodent model with the class of hemorrhagic shock (Figure 5A). The tail-cut and liver punch biopsy models correlated best with class I hemorrhagic shock, with minimal change in blood pressure and only slightly greater than 15% TBV loss. The liver laceration and spleen transection models correlated best with class II hemorrhagic shock, with TBV loss of 15% to 30%. Regarding the percentage of TBV loss, the spleen transection model was found to have significantly greater blood loss than all 3 other models (Figure 5B) (P < .001 vs the tail-cut and liver punch biopsy models; P = .003 vs the liver laceration model). The other models were not significantly different from each other in terms of blood loss. In all models, heart rate declined throughout the experiment (Figure 5C) and MAP decreased (Figure 5D). In terms of hemodynamics, the tail-cut model had a significantly smaller decrease in MAP compared with the spleen transection and liver laceration models (P < .05). In addition, the liver punch biopsy model had a significantly smaller decrease in MAP compared with the spleen transection model (P < .05). The 1-hour survival was 100% in all models. All 3 animals in the tail-cut model survived to awaken from anesthesia; however, 1 animal died in the interval from 3 to 24 hours, resulting in 2 animals (66%) surviving at 24 and 48 hours. All 3 animals in the liver punch biopsy model survived to 24 and 48 hours. One animal in each of the liver laceration and spleen transection models died before awakening from anesthesia, resulting in 2 animals (66%) in each model surviving at 90 minutes. The remaining animals survived to 24 and 48 hours. The survival beyond 1 hour includes an additional 10% TBV loss owing to the 3.3-mL blood draw at the 60-minute point, which likely accounts for the 2 deaths in the liver laceration and spleen transection groups. We developed 4 different rat models of uncontrolled hemorrhage producing blood loss ranging from 15.4% to 27.9% of the TBV. Two models (tail-cut and liver punch biopsy) simulated class I hemorrhagic shock, whereas 2 models (liver laceration and spleen transection) simulated class II hemorrhagic shock. By developing this set of animal models, we have reproducible and quantifiable methods for studying hemorrhage in vivo with the hopes of developing nonoperative therapies to treat NCTT. To develop this series of animal models that mimic noncompressible torso hemorrhage, we examined the literature of existing animal models. Several models of hemorrhage are available in the trauma and anticoagulation literature, which we modified to meet our goals. Several models of uncontrolled hemorrhage in larger animals are well established and include a lethal liver injury and aortic punch biopsy injury in pigs.15,16 We sought to use rodents because of the high volume of experiments required for the initial development phase of therapeutics. From the trauma literature, models of arterial and venous injuries in the extremities exist, but because these models do not mimic noncompressible torso hemorrhage, they were not pursued.17-19 An early study of resuscitation with hypertonic saline by Gross et al9 introduced a model of uncontrolled hemorrhage by incision of 3 major radicals of the ileocolic artery. They found a decrease in MAP to 39 mm Hg within the first several minutes and stabilization to 67 mm Hg after 2 hours, which is consistent with our liver laceration and spleen transection models. Blood loss was quantified by the number of gauze pads required to soak up intraperitoneal blood; thus, blood loss per se was not quantified directly as the primary outcome of that study. Next, Gross et al7 sought to quantitate blood loss attributed to hypertonic saline resuscitation. They used a tail amputation model in which 10% of the terminal portion of the rat tail was amputated. The authors collected shed blood over time to 180 minutes. The distribution of blood loss was similar to our findings, with most of the blood loss occurring in the first 5 minutes. Although they amputated a smaller portion of the tail compared with our model (ie, 10% is roughly 2 cm), they found more bleeding in their model, with 3.5 mL in the first 5 minutes compared with our model, which found 1.9 mL in the first 6 minutes. With this greater blood loss, the investigators7 also observed a more significant decrease in MAP from 98 to 63 mm Hg. In a different tail injury model, Capone et al8 compared early and late fluid resuscitation and aggressive (to MAP >80 mm Hg) and minimal (to MAP >40 mm Hg) levels of resuscitation, although they included a portion of controlled hemorrhage (3 mL/100 g for 15 minutes), to create sufficient differences between groups owing to variability in the tail-cut model alone. The investigators8 amputated 75% of the tail and allowed it to bleed into a graduated cylinder. In addition to the controlled hemorrhage, this process resulted in a mean blood loss of 50% of the TBV.8 Our model similarly found the most variability in blood loss when we compared the tail-cut and solid organ injury models. Next, we examined trauma models using solid organ injury. Matsuoka et al10 created a model of liver injury to study the effect of fluid resuscitation on solid organ injury. Sixty-five percent of the liver was resected and the abdomen was closed. Four different fluid resuscitation regimens were followed. Quantitation of blood loss was performed after 4 hours of resuscitation by reopening the laparotomy and measuring shed blood; thus, the time course of bleeding could not be determined. Similar to our liver laceration and spleen transection models, injury resulted in an immediate decrease in MAP, with return to a level of about 50% of baseline. The final model on fluid resuscitation from which we extrapolated to develop our model included a study by Solomonov et al11 that used a spleen injury model to study vigorous fluid resuscitation. The spleen injury was similar to our model, with the spleen transected in 2 planes between the entrances of the splenic vessels. The main difference is that the other investigators11 then closed the abdomen and did not measure blood loss until the end of a 4-hour resuscitation period, when the abdomen was reopened and total intra-abdominal free blood loss and clots were measured. They found that animals receiving no resuscitation had a TBV loss of 33% and a pattern of hemodynamics similar to those of our model. The major difference between these models and our models is that we quantitated blood loss throughout the experiment rather than at the end of the experimental period only. Our model will allow for direct comparisons of therapies designed to prevent hemorrhage, especially at early points. The aforementioned studies were all developed to study the effect of resuscitation on hemorrhage and the outcomes of hemorrhagic shock. We also looked to the literature on anticoagulant and antiplatelet therapies for additional hemorrhage models. Delaporte-Cerceau et al12 used a rabbit model to study the effects of ketorolac tromethamine and enoxaparin sodium in arterial thrombosis and bleeding. To study bleeding, they looked at bleeding time and blood loss. Bleeding time was measured by making a 5-mm incision on the external ear and measuring the time until bleeding stopped. Blood loss was measured by creating a single splenic transection and using preweighed swabs to quantitate blood loss at the end of 15 minutes. Another rabbit model by Pragst et al13 used a kidney injury model to evaluate the effectiveness in reversing dabigatran etexilate mesylate therapy with prothrombin complex concentrate. We chose not to pursue kidney injury in the development of our models because we already had several intra-abdominal injury models with minimal variability, and the kidney model showed high variability in blood loss. Several aspects make our model unique. First, to our knowledge, our study is the only one to compare different models of hemorrhage head-to-head. Furthermore, the results of our models are consistent with those of similar models published in the literature. This similarity allows for the selection of multiple models or a solitary model that meets the needs of the investigator. Second, our study is one of very few published studies that quantitate blood loss over time. This factor is critical for understanding the pattern of blood loss from each type of injury and for comparing the effectiveness of therapies designed to stop bleeding over time. Last, our study correlates each animal model with the class of hemorrhagic shock. We developed and validated 4 different animal models of uncontrolled hemorrhage using extremity (tail) and intra-abdominal solid organ injury (liver and spleen) to create reproducible and quantifiable levels of blood loss over time. These models of hemorrhage were consistent with classes I and II hemorrhagic shock based on hemodynamics and the percentage of TBV loss (ie, 15.4%-27.9%). We hope that these models will be used for the development of systemically delivered but targeted nonoperative therapeutics to stop hemorrhage. Accepted for Publication: June 23, 2014. Corresponding Author: Melina R. Kibbe, MD, Division of Vascular Surgery, Department of Surgery, Feinberg School of Medicine, Northwestern University, 676 N St Clair St, Ste 650, Chicago, IL 60611 (mkibbe@northwestern.edu). Published Online: February 18, 2015. doi:10.1001/jamasurg.2014.1685. Author Contributions: Drs Morgan and Kibbe had full access to all the data in the study and take responsibility for the integrity of the data and the accuracy of the data analysis. Study concept and design: Morgan, Pritts, Kibbe. Acquisition, analysis, or interpretation of data: Morgan, Prakash, Vercammen, Pritts. Drafting of the manuscript: Morgan, Kibbe. Administrative, technical, or material support: Morgan, Vercammen, Kibbe. Funding/Support: This study was supported by the Society for Vascular Surgery Foundation. 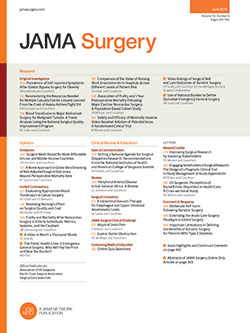 Disclaimer: Dr Kibbe is the Editor of JAMA Surgery but was not involved in the editorial review or decision to accept the manuscript for publication. Previous Presentation: This paper was presented at the 38th Annual Surgical Symposium of the Association of VA Surgeons; April 6, 2014; New Haven, Connecticut.